Our Website is not intended for children under 13 years of age. No one under age 13 may provide any information to or on the Website. We do not knowingly collect personal information from children under 13. If you are under 13, do not (a) use or provide any information on this Website or on or through any of its features, (b) register on the Website, (c) make any purchases through the Website, (d) use any of the interactive or public comment features of this Website or (e) provide any information about yourself to the Organization, including your name, address, telephone number or e-mail address. If we learn we have collected or received personal information from a child under 13 without verification of parental consent, we will delete that information. If you believe we might have any information from or about a child under 13, please contact the Organization as provided below. To carry out our obligations and enforce our rights arising from any contracts entered into between you and the Organization, including for billing and collection. We may also use your information to contact you about our own and third-parties&apos; goods and services that may be of interest to you. If you do not want the Organization to use your information in this way, you can opt-out by sending the Organization an e-mail stating your request, as provided below. We may use the information we have collected from you to enable the Organization to display advertisements to our advertisers&apos; target audiences. Even though we do not disclose your personal information for these purposes without your consent, if you click on or otherwise interact with an advertisement, the advertiser may assume that you meet its target criteria. Specifically, we use Google Analytics to measure and monitor usage trends of the OuterBanks.org website. We also use data from Google&apos;s Interest-based advertising or third-party audience data (such as age, gender and interests) with Google Analytics in order to periodically evaluate whether the content on the Website is well-matched to audiences actually using our Website and how to tailor and improve said content to appropriate user audiences if it can be improved through content changes and updates. Disclosure of Your Information for Third-Party Advertising. If you do not want the Organization to share your personal information with unaffiliated or non-agent third parties for promotional purposes, you can opt-out by sending the Organization an e-mail stating your request to information@outerbanks.org. Promotional Offers from the Organization. If you do not want to have your contact information used by the Organization to promote our own or third parties&apos; products or services, you can opt-out by sending the Organization an e-mail stating your request to information@outerbanks.org. If we have sent you a promotional e-mail, you may send the Organization a return e-mail asking to be omitted from future e-mail distributions. This opt out does not apply to information provided to the Organization as a result of a product purchase, product service experience or other transactions. Targeted Advertising. 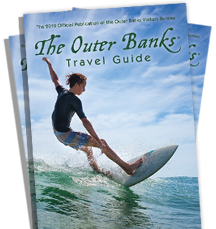 If you do not want the Organization to use information that we collect or that you provide to the Organization to deliver advertisements according to our advertisers&apos; target-audience preferences, you can opt-out by sending the Organization an e-mail stating your request to information@outerbanks.org. For certain users, you can review and change your personal information by logging into the Website and visiting your account detail page. You may also send the Organization an e-mail at information@outerbanks.org, or mail or call to the contact information below to request access to, correct or delete any personal information that you have provided to the Organization. We cannot delete your personal information except by also deleting your user account. We may not accommodate a request to change information if we believe the change would violate any law or legal requirement or cause the information to be incorrect.